Address: 550 Golden Gate Pt. Located on beautiful Golden Gate Point, Pier 550 was built in 1958. 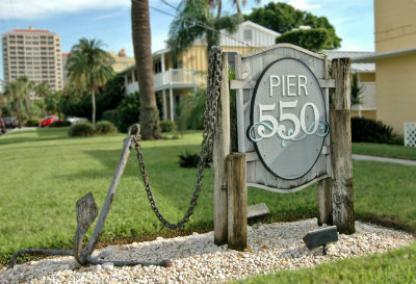 This quaint, sought after community is charming, and many residents enjoy views of Sarasota Bay and the downtown marina. You can walk to downtown shopping, restaurants and art galleries on Palm Avenue. Bayfront Park is a perfect spot for a picnic or stop for a cocktail at O’Leary’s. Just across the John Ringling Bridge, shopping and dining are available on world-famous St. Armands Circle. Lido Beach is just minutes away as well. Boat slips are available at Pier 550 on a first come basis. Potential rental income is attractive to investors, but this little gem is a perfect getaway too.